We are offering this as a limited edition print ($25.62, without frame, for a petite print) once 99 copies sell we will pull the print from sale. When you receive your print you can either send it to the artist directly who will sign and number it (e-mail me at joblesslawyer@gmail.com to arrange the mailing). Or you can request a certificate of authenticity, which has been signed and numbered by the artist, for your print (e-mail me for details) joblesslawyer@gmail.com. PLEASE NOTE IN ORDER TO AUTHENTICATE YOUR LIMITED EDITION PRINT YOU MUST USE ONE OF THE TWO METHODS DESCRIBED. Click here if you want a framed version. This print has many hidden details in its characters and colorful environment. The major theme depicted is the struggle of the young lawyer in today’s economic downturn. 1) The general feeling penetrating the market that all decent public interest and government jobs have all been snatched up, and the fact that contract positions offer low salaries with no benefits are all clearly depicted with signage throughout the village. 2) The “bridge to nowhere” feeling that often results when young attorneys use legal recruiters and headhunter services is vibrantly illustrated. 3) Insulting job post offers by small firms advertising that attorneys must work for a lengthy probationary period without being paid are represented by the drop ladder going off the side of the ravine. An unlucky lawyer is seen trying to climb back unsuccessfully from one of these positions to the left of the ladder. 4) The cut throat and competitive nature of starting out on one’s own as a young solo practitioner, with little knowledge of the inner workings of the industry, is depicted by a new attorney descending the rope ladder with an older sly attorney standing above ready to cut that rope. 5) The centerpiece of the print is the Big Law Monster off in the distance. Hanging off the edge of the cliff holding on for dear life but being pulled down by economic pressures. In an effort to survive the Monster’s solution is to forcefully dump all of the attorneys holding on into the river of unemployment miles below. Two onlookers are watching the attorneys fall to their demise and are keeping track of the numbers on a chalk board. 6) The protagonist, a confused and bewildered recent law school graduate, takes in the whole scene hoping to make sense sense of the situation, but feeling the negative pressures that abound. This is a charming legal satire. 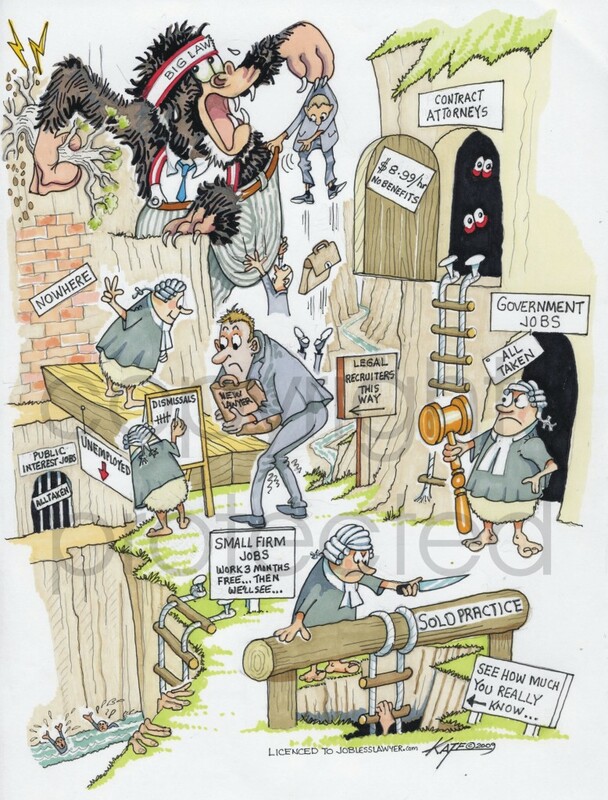 The plight of the young lawyers job search during the current recession is captured well here by Kate Scurfield, a brilliant cartoonist from the UK with a knack for detail. Kate turned my vision into a reality. 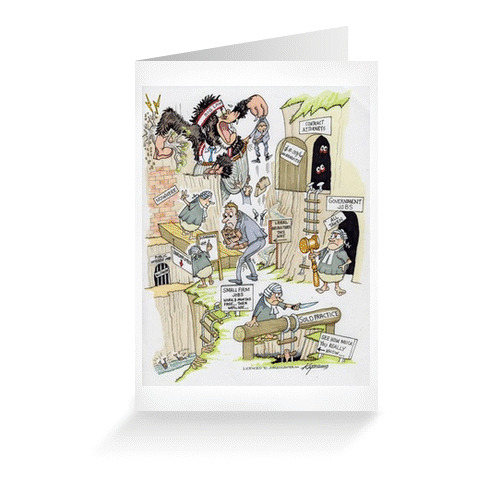 You can also buy this cartoon on greeting cards if you just want to send your friends an inexpensive laugh! Wow… the detail in this is amazing. I relate wholeheartedly to this picture because it displays accurately what I have been experiencing over the last 6 months. It has been said that good art imitates life, and that is exactly what we have here. KUDOS on a great piece! I've already placed my order.